As part of a larger campaign advocating the elimination of violence against women, several events were held on the Beirut campus in early November and last week. Posters raise awareness on the exploitation of women. VPSDEM Elise Salem (2nd from left) and IWSAW Director Dima Dabbous-Sensenig (3rd from left) with LAU students. LAU officers and faculty members in front of the campus stand. Danielle Howayek during the open discussion following the film screening. As part of a larger campaign advocating the elimination of violence against women, several events took place on the Beirut campus in early November and last week. The latest activity included setting up stands for two days and collecting signatures in support of a draft law that criminalizes domestic violence in Lebanon. The activity began on November 25, coinciding with the start of an international annual event organized in Lebanon by the NGO “KAFA: Enough Violence and Exploitation,” in collaboration with LAU’s Institute for Women’s Studies in the Arab World. The umbrella event, dubbed “16 Days Activism Against Gender Violence,” is to conclude on International Human Rights Day (December 10). 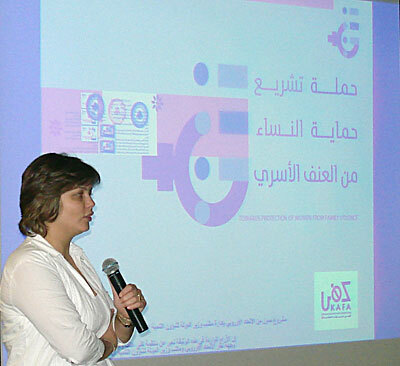 “Given that one of our objectives is to serve as a catalyst for policy changes regarding the rights of women in the Arab world, we wanted to mobilize the students at LAU, along with the faculty and staff, to support efforts that aim at combating domestic violence,” said Myriam Sfeir Murad, managing editor of Al-Raida, IWSAW’s quarterly journal. The signature collection first took place on campus November 3-5, along with distribution of pamphlets, awareness-raising stands and film screenings. A short film titled Survivors—a mixture of fiction and real-life testimonies of abuse—showed a wife ironing clothes as her husband entered home. In the second scene, Lebanese women described their euphoric initial relationships with their husbands. Next, the wife from the imaginary story asked her husband for money to buy medicine for their sick daughter. The film then shifted to the real-life women, this time explaining how their marital conflicts started. In the next scene, the fictitious husband was burning his wife’s hand with the iron, hitting her and accusing her of not having taken care of his daughter, while the latter watched helplessly. After the screening, Howayek discussed the movie with students. Together, they classified the types of violence portrayed, identified the victims, and argued about some captivating incidents recounted by the women, such as their sufferings at police stations and courts. “Thanks to the documentary and the poignant testimonies of the abused women, our students realized that anyone can be a victim and it is our duty to help,” said Sfeir Murad.